The designers of the Apollo spacecraft were always careful to build redundancy into their systems to ensure that a single point failure could not jeopardise the crew - a philosophy that extended to the guidance and navigation system. The designers were very aware that any of its exotic components could fail at any point in the mission. 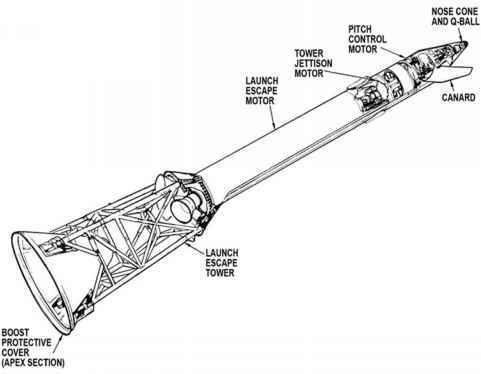 To this end, the command module had a second control system which, although it shared many components with the G&N system, could operate entirely separately. This was the stabilization and control system (SCS) that could autonomously maintain attitude, allow the crewmen to make accurate manoeuvres and even manually control the SPS engine if necessary. Like the G&N system, it used gyroscopes, but these were arranged in a different way to the gyroscopically stabilised IMU. The gyroscopes for the SCS were not attached to a stabilised platform. Instead, they were fixed to the spacecraft structure and had to move with it. Being mounted in this way prompted the name body-mounted attitude gyros (BMAGs). Like all gyros, they have a tendency to want to remain in one attitude, and when the spacecraft rotated, they exerted a force on their mountings. As this force was a measure of the rate of the spacecraft's rotation, the BMAGs were very suitable for measuring rates of rotation rather than absolute attitude. Only by processing the rate information within electronic boxes could a measure of absolute attitude be derived. The resultant attitude reading was highly prone to drift, much more so than the IMU, so prior to using the SCS intensively, the crew would press a button which updated the BMAGs' electronics with a better idea of the spacecraft's attitude from the IMU's platform. If, in an emergency situation, the IMU failed to work, the crew had a procedure whereby the attitude information from the BMAGs could be aligned by sighting on the stars.